Installation of kitchen counter tops occurs after the carcasses have been leveled and connected. Levelling is carried out through raising or lowering the adjustable plastic legs on the base of the carcasses. This connection and levelling process takes some time and requires lots of vice grips and braces. The height of the kickboard needs to be considered when levelling. Squaring up corner carcusses seems to take the most time as they are the focal point of the connections. Don't forget to level laterally as well. 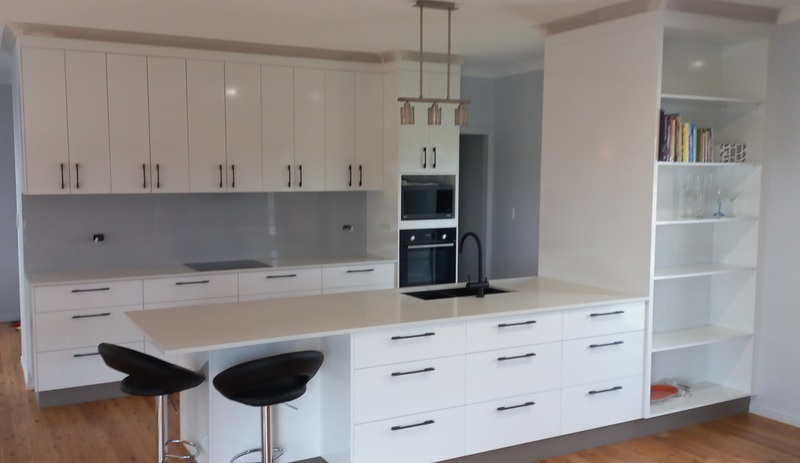 I studied the kitchen countertop options such as stone, imitation stone, wood, ceramic tile, concrete and various laminates, but as I was on a budget, standard melamine with rolled edges was my choice. Next step is the kitchen counter top and here you will see how well you have leveled and straightened the carcasses. Dummy fit the bench-top onto the carcass assembly and see if it needs to be shaved or altered at the corners. More often than not the wall is not straight either so testing is good. Check your bench-top connectors to see how they work. There will be large pre-drilled holes at the adjacent edges where the tops join and the connectors are assembled. 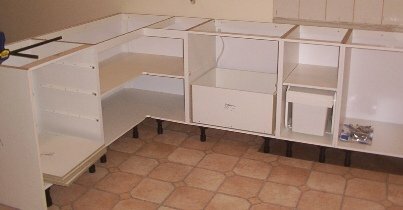 Find the stove shape template and the kitchen sink template and mark them out according to your plan specifications. Bore pilot holes in the countertop and using good jigsaw with a "new" blade, cut them both out. Have a second person there to hold the cutouts level towards the end of the cut so they don't splinter. Use a very generous bead of liquid glue along the kitchen carcass top surfaces and lay the bench down, square up and level as you push down. 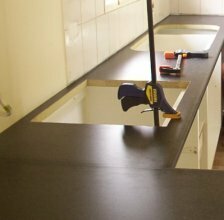 Apply silicon to the exposed edges of each bench top join to inhibit water incursion. Secure adjacent benches with the supplied fasteners. Anchor with braces to insure adherence. Install the kickboards on their securing clips to the legs of the carcasses. Again, seal all edges. 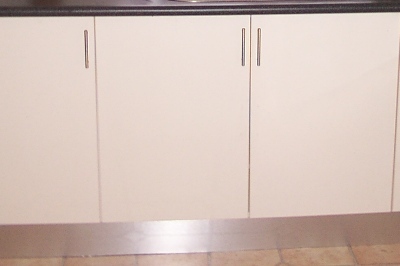 Kitchen cabinet door hinge and door furniture installation are next. The hinge seats will be pre-drilled on the carcass uprights so it's pretty simple. Then snap on the quick fit hinges to the carcasses to fit the doors. Use a template to mark your door furniture holes before boring and installing.